Since I joined the Forum last fall, I've read all kinds of things about the best vacs available as well as complaints about labs constantly shedding and shedding. Have an Electrolux vac with a separately driven brush roll and I'm pretty happy with it. On Friday my mom dropped by to have our regular coffee and chat and she told me she'd read a story in the paper about a lady who'd discovered a very efficient method - she was using a squeegee. It really cracked me up and to show my mom she can't believe everything she reads in the paper I decided to show her. 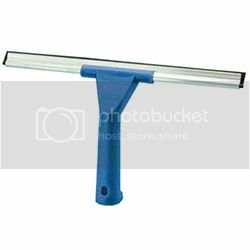 Had vacuumed the room just the day before and was pretty proud of the result, so I grabbed my old squeegee, looks almost identical to this one , softly raked the carpet and to my disbelief, there was a pile of dog's hair. Today I gave it another try; cleaned the brush roll, vacuumed the bedroom carpet and then started another squeegee test. The result: after ten minutes of hard work with the vac I collected two handfuls of Mel's hair. Where's my squeegee? Gotta try that! A damp sponge works well too. Thank you, thank you for the suggestion. I did have one for outside windows, don't know where it is; may have to get another. Bet it's kinda like the Zoom the way it grabs and if it seems to not be working as well, a quick wash with dish detergent, it's like new. Hmm, need to test this. Think I know where our squeegee is. I know it does; I actually started with damp palms of my hands, when I almost got burns, I switched to damp sponges that worked, my hands were safe, but the carpet was damp afterwards and the sponge destroyed in a few minutes. I cleaned three carpets with the squeegee and it's as good as new, all it might need later is, a quick wash as POPTOP suggests, but that's about it. Faye read somewhere about using a dishwashing glove - you know, a rubber one with a patterned palm and fingers - to de-dog hair upholstered furniture. It works! And, I tried it and darn if it doesn't work! I see my immediate future spent crawling around squeegeeing my rugs!